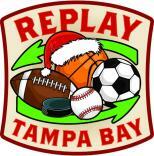 Replay Tampa Bay Taking Place Through December 27th! Hello again Sports Fans, Tony here to remind you about Replay Tampa Bay Holiday Sporting Goods Drive taking place now through December 27th! This provides a unique opportunity to help local kids in need this holiday season by donating your new or gently used sporting goods at one of three Elder Automotive locations and receive a voucher for a complimentary small Papa John’s Pizza* (from participating locations) and a complimentary McDonald’s McCafe beverage* (from participating locations). Each Elder Automotive location also has a register to win special prizes, such as suite tickets to local sporting events. For more information and to view the complete listing of donation locations, log onto TampaBaySports.org. Make sure you check back soon for more on Tampa Bay area events and Tampa Bay Sports!